In September the 2011 Linux Graphics Survey came to an end, but due to Oktoberfest, AMD Bulldozer Linux testing, OpenBenchmarking.org developments, and other matters, I didn't have time to look at the survey results until this weekend when getting ready for the Ubuntu Developer Summit. Here's the 2011 results looking at what Linux desktop end-users are running when it comes to graphics cards and drivers as well as their key concerns. 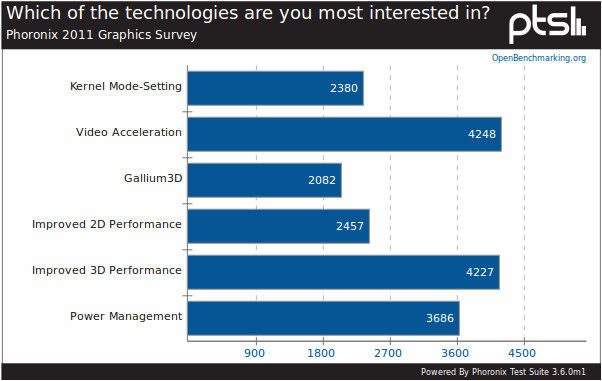 In terms of what graphics-related technologies the Phoronix survey-goers are most interested in, improved 3D performance while a few votes behind was video acceleration. Shortly behind in third place was GPU power management. This is just like the 2010 survey results where it was improved 3D performance, video acceleration, and then power management. Much further behind was interest in improved 2D performance, then kernel mode-setting, and Gallium3D. KMS and Gallium3D not getting much interest isn't too surprising since both technologies are now widespread across the open-source drivers (except for the Intel driver still being on classic Mesa) and aren't directly user-facing. NVIDIA remains the most popular brand GPU brand in use followed close behind were ATI/AMD and then Intel. Again, similar to last year's results for the three main graphics vendors. There is just a couple dozen (unfortunate) respondents still on Matrox, VIA, and SiS / XGI graphics. 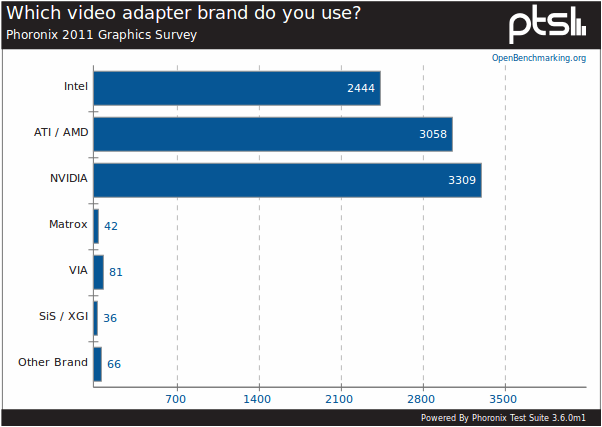 For ATI hardware, the 2011 results show more of the Phoronix survey respondents using the xf86-video-ati driver over the Catalyst / fglrx binary driver. There's also a small chunk of people still living off the defunct xf86-video-radeonhd driver for whatever reason, which is surprising since the features now offered by xf86-video-ati certainly surpass this Novell-developed driver. 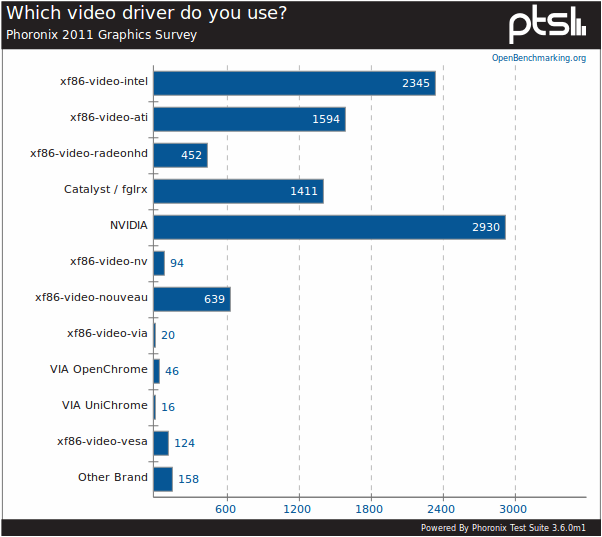 In terms of NVIDIA hardware, the NVIDIA binary driver remains the most popular driver overall on the Linux desktop. Only a small portion of NVIDIA hardware owner are using the open-source Nouveau stack. Less than 100 people were using the defunct xf86-video-nv driver. Like the RadeonHD situation, xf86-video-nv users should switch to Nouveau (well, unless you're a BSD/Solaris user without Nouveau support). There is just over three dozen OpenChrome users doing this survey while there is still a couple xf86-video-via and VIA Unichrome users. The total number of VIA driver users is less than the number of those stuck to using VESA.